This hotel enjoys a stunning setting close to Singaraja, lying just a short boat ride from the unspoilt Menjangan Island. The city of Singaraja is located just a 50 minutes' driving distance away. This wonderful hotel lies in the small, fishing village of Pemuteran, in northern Bali. The hotel is the ideal option for guests who are eager to explore the rich culture and natural beauty of the island. 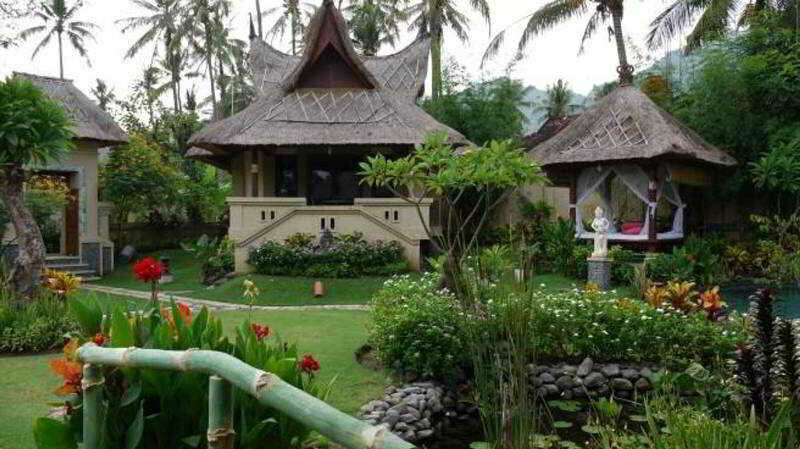 This wonderful hotel welcomes guests with traditional Balinese hospitality. The guest rooms are luxuriously appointed, providing a haven of peace and serenity, in which to completely relax and unwind. Guests are invited to enjoy a host of exciting activities at this hotel. Guests can take advantage of the wide range of facilities and services that the hotel has to offer. Located on the more secluded northwestern coast of Bali, a world renowned holiday destination, this luxurious establishment boasts a prime location close to shallow coral reefs and natural surroundings. West Bali National Park is just 37 minutes' drive from the hotel and Menjangan Island, a small peaceful retreat, is a 30-minute boat ride. Guest can also take short trips to the numerous waterfalls, lakes and therapeutic hot springs nearby. The property is composed by elegant bungalows featuring wooden Balinese interiors and typical rustic day-beds that will encourage reading a good book. All those sports lovers will feel right at home with the water activities on offer. Snorkelling and scuba-diving are just a few of all the wonderful experiences. In this quiet little corner of the Earth, this hotel brings you a wide range of home-cooked dishes using traditional recipes. This family-friendly beach hotel is situated on the coast, nestled on the crystal clear waters of Pemuteran Bay with a backdrop of nine majestic mountain tops. Ngurah Rai International Airport is approximately 95 km from the club resort.This property was built on the foundation of community involvement, with local wisdom applied to every aspect. Facilities available to guests in this 24-villa spa complex include a lobby with 24-hour reception and check-out services, a hotel safe and currency exchange facilities, as well as a laundry service (fees apply), TV lounge, café, bar and restaurant. Guests may also take advantage of the Internet access, room service and a car park.All villas offer a private swimming pool and outdoor daybeds. Each villa features a king-size bed, an en suite bathroom with shower, bathtub and hairdryer, a kitchenette with minibar, microwave and tea and coffee making facilities and a private balcony or terrace. Other in-room amenities include a direct dial telephone, satellite TV, Internet access, safe and individually regulated air conditioning.The spa centre offers a variety of soothing massages and therapy treatments. The traditional massages utilise aromatic oils to relieve tension and improve blood circulation. An additional fee applies to all treatments. Guests may also take a dip in the indoor swimming pool with children's swimming area and poolside snack bar, or enjoy a game of tennis. The nearby beach is sandy.For guests' culinary pleasure, the beachfront restaurant serves breakfast, lunch and dinner, and offers international, continental and local Balinese cuisine. 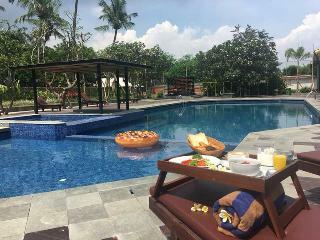 Breakfast is served as a buffet, and there is a set menu for lunch and dinner. A la carte options are also available for lunch. Guests can additionally choose from the menu and utilise the room service at their disposal. Nestled away between the Bali Barat National Park and the Java Sea, the secluded and exclusive Matahari Beach Resort & Spa is a perfect destination for connoisseurs of luxury and relaxation. Experience Matahari's way of life. Wake up to the sound of chirping birds in the tropical garden, listen to the ocean waves during your morning yoga session, explore quaint neighbouring villages and surroundings on bike, and get pampered in the award wining spa before you indulge in a sensual gourmet dinner in a romantic pavilion. This club resort is located in the Pemuteran region on the tranquil, unspoiled north-west coast of Bali, approximately 50 km from Lovina Beach and 15 km from Menjangan Island. Guests can reach the eco hotel in around three and a half hours from Ngurah Rai International Airport.This property blends wonderfully with nature and was built using only natural indigenous materials. It offers a relaxed setting surrounded by tranquil gardens and ponds and the surrounding mountains enhance the beauty and tranquillity of the establishment, making it the perfect place for families as well as newlyweds. The air-conditioned resort offers guests 45 rooms and a lobby, hotel safe, bar, restaurant and room and laundry services (fees apply to the latter two).All rooms are spacious, bright and designed in a Balinese style. Each room is equipped with modern amenities to ensure guests' comfort, they are surrounded by a lotus pond and lush tropical gardens and all overlook the gardens, ocean, or the mountains. In-room amenities include an en suite bathroom with shower, a double or king-size bed, direct dial telephone, TV, safe, mini fridge and individually regulated air conditioning. Guests may also relax on their private terrace.The outdoor swimming pool is the perfect place to relax and enjoy the sunset while swimming. Guests also can enjoy a spa or massage treatment (fees apply to both) or go snorkelling by the sandy beach near to the hotel (subject to an additional fee).The beachfront restaurant serves breakfast, lunch and dinner, offering international, continental and local Balinese cuisine. Set menu and à la carte options are available for lunch and dinner. 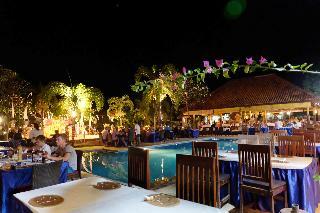 This charming hotel is located in Pemuteran. The property comprises 28 cosy guests rooms. The hotel offers Wi-Fi internet connection on-site. The reception desk is open all day long. Unfortunately, there are no bedrooms where customers can ask for a cot for the little ones. Brits Resort Lovina is not a pet-friendly establishment. 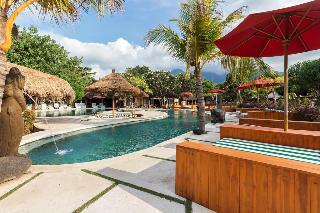 Travellers arriving by car will appreciate parking available at Brits Resort Lovina.